1, For best results cook from forzen. 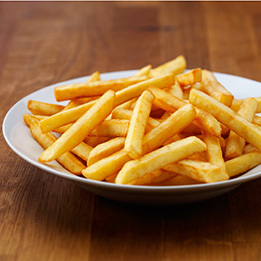 ensure the fryer temperature is set to 175C, fill the basket to the halfway point and deep fry for 3 minutes, shaking the basket halfway through the cooking process. Drain the oil from the basket for 10 seconds, empty into a large bowl and toss with the chinese salt and pepper style seasoning, decant into serving bowls and top as guided. Pre prepare your ingredients by finely slicing the red pepper and spring onion before serving to aid with assembly of the dish.